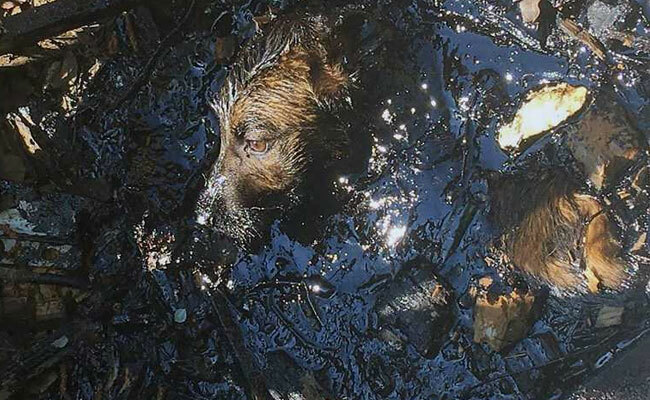 Animal shelter volunteers have rescued a dog trapped in a tar pit for two days at a construction site outside Moscow and are now looking for a home for the stray. "Although the hole wasn't deep it couldn't get out, but it survived as it was able to keep its nose out to breathe," Oleg Larchenko of the Forest Shelter told AFP on Friday. The young stray which the volunteers named Oreshek (Little Nut) took three hours to clean using chemicals and lots of shampoo, and is now recovering at the shelter. "I'm confident Oreshek will find a home as the story has attracted lots of attention," said Larchenko. Oreshek has a better chance than strays in the 11 Russian cities hosting the World Cup next month as authorities increasingly put down dogs running loose so as to get them out of the way of the thousands of expected fans.